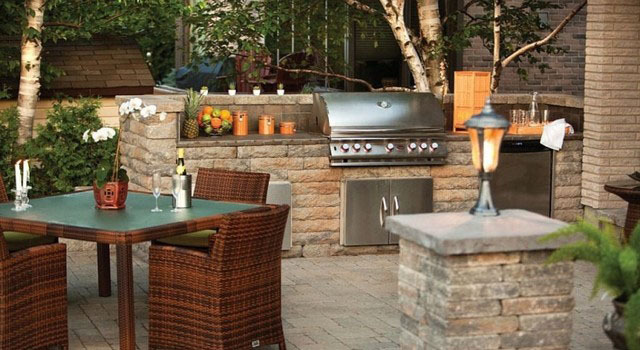 Outdoor kitchens custom Marlboro,NJ Grinkevich Lawn & Landscaping Custom designed to fit your needs and budget. Free estimates, If you can dream it Marlboro, NJ we can build it. Paver blocks that make a statement. Enjoy being the host? Love inviting guests for dinner and BBQs to your home? Wish you could transform your backyard into a luxurious outdoor living space and host the perfect cookout that your friends remember for years? If yes, then get in touch with Grinkevich Lawn and Landscapes. We can customize your outdoor living space to your needs, exactly the way you have imagined. Simply put, we make dreams come true. And that is not an overstatement! We have the experience, the expertise, the equipment, and the eye for creativity that enables us to design and create outdoor living spaces that exceed expectations in both functionality and beauty. We create spaces that compliment your landscape, suit your needs and reflect your style. When it comes to creating outdoor living design, we empower you to think and dream big without any restriction or limitation. Anything you can dream, we can build. We don’t restrict you to any certain type of finish or brand of appliance. You choose and we deliver! We custom design and build outdoor living spaces using quality material and equipment. Our work reflects excellent workmanship and technical prowess. Our trained staff designs your space keeping functionality, ambiance and curb appeal in mind. At Grinkevich Lawn & Landscapes, we specialize in creating outdoor kitchens that are built for performance and designed to envy. Our attention to detail and quality craftsmanship is what helps us deliver what we promise. From the layout to outdoor kitchen amenities to appliances everything is designed and selected specific to your needs, desires and budget. Our alliance with best kitchen appliance manufacturers enables us to offer you the best lifetime warranted stainless steel appliances at the most competitive prices. Our custom designed outdoor kitchens include options like counter tops, pizza ovens, BBQ islands and amenities like gazebos, cabanas and pergolas. We strive to provide you outdoor kitchens that are functional and enhance the beauty of your outdoor space. Our custom designed outdoor kitchens include options like counter tops, pizza ovens, BBQ islands and amenities like gazebos, cabanas and pergolas. We strive to provide you outdoor kitchens that are functional and enhance the beauty of your outdoor space.